Can Radar and RFID Stop Drivers From Killing Cyclists? Last month, London reached a grim milestone: Six cyclists were killed within 14 days, sparking a massive "die-in" protest. London isn't alone; 176 cyclists or pedestrians were killed in NYC last year. The rapidly rising death toll is spurring a race to build a technology to warn drivers before they hit someone on foot or bike. A protest in London this month. Image: Getty/Peter Macdiarmid. It's a sad business. As The Guardian notes, the majority of deaths are caused by truck drivers, quoting statistics that show trucks are involved in more than half of cycling deaths but only account for five percent of road traffic. Similar numbers hold true stateside. Now, Transport for London—akin to the Department of Transit in New York—is testing three systems that are designed to issue warnings to drivers who might not see a cyclist or pedestrian in the path of their vehicle. Each is different, though a common goal is to warn drivers of cyclists in their blind spots—especially when it comes to the dreaded left turn, which has played a role in many of the recent deaths. We took a closer look to find how what exactly these systems do. A one-year-old engineering firm in Bristol called Fusion Processing makes a product called CycleEye™ that uses inputs from cameras and radar mounted on buses, designed to record data within six feet of the each side of the vehicle. The data is pulled through a "detection algorithm" that, according to Fusion, makes it possible to detect the lone cyclist against a mess of trees, weather, and moving cars. Then, it alerts the driver to the danger. "This not only reduces false alerts, but reduces the cognitive load on a busy driver, enabling a faster response in potentially critical situations, in turn providing a more effective detector," the company explains. Then there's Safety Shield Systems, a company that's using the same technology to spot cyclists and pedestrians that self-driving cars use on the road. The proprietary tech was developed by the Israeli company Mobileye, which uses video inputs and motion sensors. But Safety Shield uses the data to warn drivers rather than steer the car. It does this in two ways: First, via a heads-up panel that shows where the cyclist is, and then, through a "critical" sound warning if a collision is imminent. Finally, The Guardian points to Cycle Alert, a system that requires cyclists to attach a small RFID tag on their bike. The tag is motion-activated, so when you grab your helmet or bike, it knows to begin sending out radio-frequency electromagnetic fields. Then, buses and trucks fitted with the appropriate receptors would intercept them at certain distances, and warn the drivers when a cyclists is too close. The problem with the RFID solution, obviously, is that it would require every single bike in the city be fitted with the tag—and it doesn't do much for pedestrians. On the other hand, it would be easy to use technological solutions like these as a crutch, when in reality, it'll probably take a mix of tech and simpler efforts—education and outreach—to fix the problem. 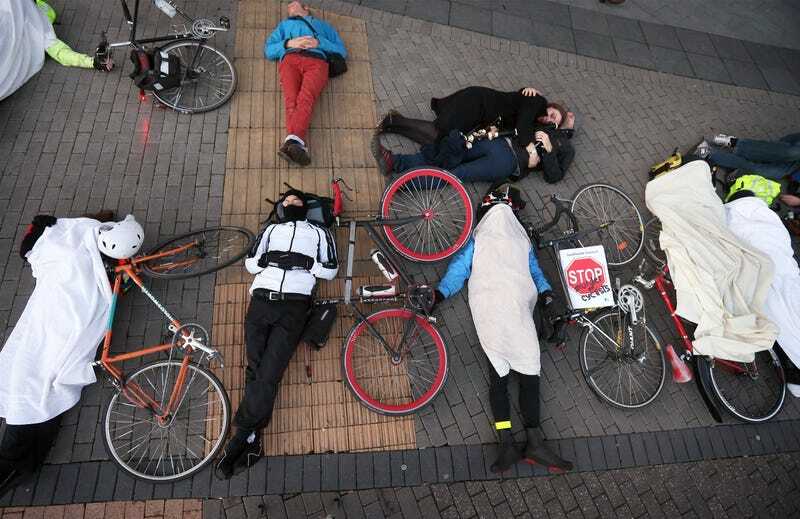 Lead image: Cyclists at a "die-in" protest in London this month. Image: Getty/Peter Macdiarmid.